Whole Body Vibration Therapy – How does it work? What does it do? Whole body vibration therapy has been around for a few decades now. You may have seen the old time vibration units that used a belt in old movies and cartoons. These manufactures claimed to help reduce inches and burn body fat. Unfortunately, this technique was not very effective, as vibrating only one part of the body did not have much of a metabolic effect. Recently, there have been several tweaks to the vibration therapy concept. New vibration platforms have been clinically shown to help improve balance, strength, coordination, and have some aesthetic affects as well. Several studies are revealing that in some cases, whole body vibration of therapy can reduce the appearance of cellulite. By standing on a platform that is vibrating rapidly, the body is forced to adapt to the un-even surface. Muscles are constantly firing and contracting, your nervous system is fully activated in terms of keeping your balance. What can be a 15-minute workout, will actually feel like you’ve worked out for about 45 minutes due to the intensity of standing on the whole body vibration platform. Dr. Gil works with a patient on the vibration platform. 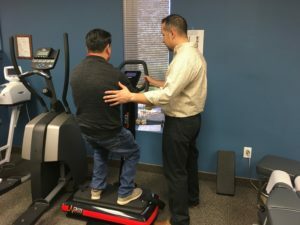 We have been using whole body vibration therapy in the office for about four years now with great results. It is a simple yet very effective way of helping to increase our patient’s core strength and leg strength without much impact on their joints. Other benefits a vibration therapy include activation of the lymphatic system. This is a great tool in helping patients who are dealing with swelling, or patients who are undergoing lipo-laser therapy to help reduce body fat distribution in specific areas. Patients are amazed at the intensity of the work out without putting undue stress on their body. We invite you to experience this for yourself. If you have any questions about whole body vibration therapy, please feel free to contact our office at any time at 845-634-8877. Dr. Mike and I will be more than happy to answer any questions that you may have. New City Chiropractic Center has been serving the Rockland County area for three decades providing chiropractic care to individuals ages six months and up. A Certified Sports Team Physician, Dr. Michael Cocilovo is a long-time member of the New York State Chiropractic Association and is Past President of the Rockland County Chapter of the American Chiropractic Association. Dr. Gil Rodriguez is board certified in Chiropractic and Physiotherapy by the National Board of Chiropractic Examiners and a current member of the American Chiropractic Association, as well as of the New York State Chiropractic Association.